At the immense limestone table-plateaus, the so-called Causses you become aware of a wide open horizon, slightly undulated with a average height close to thousand meter. Here rain comes down without streaming, absorbed by the mass of limestone. It's the land of sheep, sheep for meat et sheep for milk, for the Roquefort dairies. Limestone is an easy to win bedrock . Its breaking in strata of very different thickness. These layers are serviceable in their natural form. Thin layers generates flat ones for masonry, roof- and floor-slating. Thick layers and big blocks are providing angle-stones, cross-connection-stones, lintels, door- and windowframes and the eventual protuding stones for futur neighbour construction(s) in times of demographical or economical highlights. The early disafforestation of the highlands (already in the stone age and mostly terminated by the mobile glass industry from Milau) are responsible for the absence of wood in general and timber in particular. That's why everything even rafter and interfloors are realised in stone, rooms, floors and roofs are vault-constructions. THE caracteristic of causenard architecture. the scarceness of flat terrain. Although it’s the same geological material the architectural characteristics differs as much as those in the contact-zones with granite or schist. The most of the farms at the Causses count two main vaults : the interfloor and the arched roofing. The supporting vault, the lowest one between the ground level and the first floor is a flattened arch, this type of vault exerces his main forces horizontal which permit to overstrain a relative wide breadth. The superior vault is a so-called broken one, consisting of two half arches in support of eachother.The oblique pression of this vault equilibrates the sidewards pression of the lower one. Their resultant is absorbated by the the part of the wall were the broken vault begins. To compensate the horizontal forces of the construction, this superior vault is made quit high. This system realizes a big volume which can easily lodge a third level when required with a wooden floor in between. Normally the vaults are built out of unselected stones (pierre tout venant) like the walls. Only churches and other buildings of (public) importance are made out of hewd stones. The vault-shape offers a numerous possibilities to variate, even while respecting the forces. A vault is set up at both sides of a wooden mould, which is moving forwards with the advancing of the work. The upper side of the lowest arch is filt up whith stones, earth, straw and other debris and is carrying the tiled floor with the big flat limestone slabs of the kitchen/living. Intersections of the vaults and al the openings have to be solid and rigid for not to compromise the coherence of the construction, which is transmitted by every stone to his neighbours. Also for coming in for light and visitors they're useful. Because the gable walls don't support the main weight of the vault there can be made door and windows quit easily without compromising the solidsity of the building . This is the simplest way, used when the house is built perpendicalar at the slope. The disadvantage is that it don't permit the daylight to come deep in to the house. The long-side one: La façade sur le mur de long pan also called the gutter wall: mur gouttereau. In this type the openings have to been realised by construction of cross-vaults ancred in the main one. All the openings are lining up in a axe of cross-vaults, which receives the pushing force of the heayvy roof leading the resultant at either side in the very thick wall beneath. In both types of farm(mas) the lowest and higher level only communicate by outside, while to force a gap in the supporting vault was impossible. The main door of the kitchen in both cases can be reached by steps built over a vault with a paved platform on it. This sometimes covered space is complementary living space when the climate permits it. The gradient of the roof, between 40 and 60 % is determinated by the upper vault and the height of the wall. The tangent of the upper vault is filt up with a layer of earth and covered with triangle little stiffy stones to hold the heavy limestone slabsby their own weight. At the base of the roof the largest slabs (les gouttiers-the gutters) hanging over the walls to protect them. Then their dimensions decrease whith each higher range til the top, formed by flat placed slates. In the type of ‘façade à long pan’, the different square roofparts have to been integrated in the angle by round-formed slate-ranges. These so called noues (knot) en arrondis are masterpieces. To avoid snow wind and water to penetrate the roof each slab has to be covered 2/3 of their surface by the uppers. The weight (200 à 250 kg / m2, or even more) is a welcome force to block the masonry of the vault. So it's extremely stupid to undo one side of the roof, out of equilibrium the building will collapse. Certain more recent roofs are only supported by vaulted arches of stone in stead of a whole vault.These arches are connected by timber. The slabs also are resting at timber with a very little gradient to avoid them to slide down. But with the generalization of slatestone slates which can be nailed this problem is solved..
Windows and doors are mostly made at the sunny side. Placed in the longest side of the building they are directly under the eaves with a perpendicular little vault to the main one. This so-called lucarne is an other characteristic of limestone architecture. Otherwise ,if the orientation of a gablewall is to the sunshine then the openings are made there. 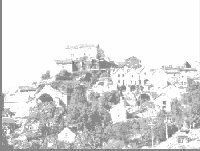 Contrary to the architecture of the limestone valleys, or schist cevennes with their close knot hamlets, here the most annexes are juxtaposed. Because space is available, only to share walls or to improve a buildings solidity some annexes share walls with the main building or eachother. 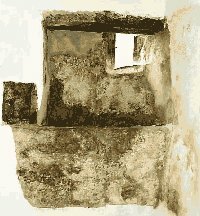 the bread-oven in the courtyard or integrated in the chimney gable with it's entrance in the chimney. The threshing-floor to threat the cereals which florish well at the Causses.In general in touch with the straw-lof. Dolines, cultivated former waterholding depressions with red fertile earth,or collapsed rockroof of a shallow underground cavity. The deep ones also originates by the dissolving calciumcarbonate of the limestone rainwater rock which hollows out easily. Caverns and cavities, an amazing underground world, all over the causses. The well nearby the kitchen or even in it. Every mas collected the maximum of rain water in its eaves which was stored in a big watertank ( la citerne). Heaps old stones cleared from the field the so called clapas. The tumulus, very old graves under a base of earth under a heap of stones, a lot of neolithic dolmens and other prehistorian 'architecture' like menhirs. The landscape is completed with a very special flore (sometimes making part of architectural elementsgrasses, shrubs, trees and a lot of protected flowers) and faune like the griffon vulture taking habitat in the geological architecture, the nature of the Causses. In the valley certains components remains the same, but a lot also differs related to presence the relief and different climatic conditions. Beatiful little properties sticked to the slope are settled near a source. They cultivated fruit (pears & apples), grapes for wine and kept little goat/sheep- herds. The lowest part of each house,the cave is hewed out of thebed-rock, laying partially in it, serves to make wine, to preserve fruit and contains a watertank. Beside there is another cave for donckey, mule, pig, a few goats and sheep. At the first floor lies the kitchen, the living, to enter by steps and a little platform. The second floor whith timber roof or stonen vault is for storing branches with leaves or other things, herer hay is rare. 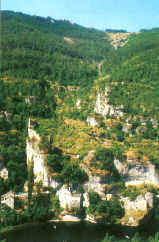 In the dolomitic sector in the gorges themselves, ruiniform reliefs bordering the plateaus, the habitat has a troglodyte caracter: the rocky walls were integrated in the houses. They are completely integrated in the environment of ledges that overhang the valley. The presence of water and passages or bridges are in this country -of difficult acces, the main reasons to settlement ;farms, hamlets or even villages. In this close knot-type of hamlets and villages each house lays in a very narrow street with a window towards the valley.. The quit homogene architecture of the valleys and plateaus changes suddenly where other geological matearial occurs. In the Tarnon-valley for instance, the sources appear were the permeables layers of limestone meet the impermeable schist . This has had immediately its reflection in a combinated architecture with stonen vaults as well as timber roof and floors. A bit further direction cévennes schist starts to be the predominant material : only angle-stones and the stones around door- and windowframes and are hewn in pale limestone. The resistance of schist to pressure is inferior to that of limestone, granite or fraidonite. At the littles lime-stone plateaus separated from the causses the material is of an other nature, an other geological niveau. Here you can find caussenard architecture co-existing with rafter constructions. In the contact zone with granite du mont Lozère both materials are mixed up in an amazing combination of characteristics of both architectures, like a caussenard model all realised in granite. Causse Méjean (mejan:in the middle) ,highest point :Roc des Hourtous, le hameau de l'hom, archaeoligical museum at La parade: "la Borie"
Otherwise ,if the orientation of a gablewall is to the sunshine then the openings are made there. . The lavognes, little clay-lined depressions, impermeable filled up with rain-water, the only water available till 1965.
and faune like the griffon vulture taking habitat in the geological architecture, the nature of the Causses.